“I’d play against these guys on one leg,” Phillips insisted before the game. “We have to beat these guys. All they do is b***h and moan about everything — all of them. They’re little b***hes — all of them. Stay with me here. I know it is sacrilege in the labyrinth of Cardinal fandom to allow someone to speak ill of the home team, and worse yet to believe it. But is it possible Brandon Phillips was just ahead of his time in realizing what many around the Cardinal organization have since? The 2010 Cards just weren’t built right. They had clubhouse issues. The manager didn’t have any faith in the youngsters on the club and therefore his roster depth. They seemingly couldn’t motivate themselves. They appeared to play to the level of the competition – to wit, the 2010 Cards were 37-23 against teams .500 or better and 49-53 against teams below .500. It’s clearly where they lost the division, as the Reds cleaned up to the tune of 71-38 against teams below .500. Using the motivation of the brawl touched off by Phillips’ comments and subsequent “hello” to Yadier Molina on August 10, 2010, the Cardinals wound up sweeping that series in Cincinnati and came back to St. Louis in first place. All was right with the world. Cardinal fans expected the Cardinals to use that series as a springboard to finishing the season strong and head to the playoffs for the second straight season and a chance at redemption for the early 2009 exit at the hands of the Dodgers. Instead, a mere three weeks after leaving Cincinnati in first place with a one-game lead, the Cardinals found themselves eight games back of the Reds and essentially out of the race. They finished the season 22-27 (and needed a five-game winning streak to close out the season to even get there). They hit .252/.321/.369 in those closing 49 games. John Mozeliak and the rest of the Cardinals brass set about remaking the “character” of the Major League roster in the off-season, bringing in veterans Lance Berkman and Nick Punto via free agency. Shipping out Brendan Ryan – a player well-liked by the fans but who had a fractured relationship with many of his teammates – for scrappy (yes, that word adds value in this context) Ryan Theriot. If clubhouse issues were a reason for the failure of the 2010 Cardinals, it was made certain that excuse couldn’t be used by the end of the 2011 season. Tony La Russa has placed unquestionable trust in Colby Rasmus early in this season. Rasmus has clearly responded well. The young arms starting to make a name for themselves in the bullpen have garnered early praise from La Russa, something not to be taken lightly. The manager has moved swiftly to replace Ryan Franklin (perhaps not swiftly enough for most Cardinal fans) with Mitchell Boggs and *knock on wood* the early returns have been very good. The 2011 Cardinals have won four series in a row following their slow start. So far, only the Pittsburgh series is the only glaring “shoulda won” that they haven’t. Albert Pujols is beginning to round into form at the plate. Matt Holliday is pacing an MVP-type season in April. The bats have heated up. The pitching has been incredible (imagine if Adam Wainwright was making starts too!). This 2011 Cardinal team has shown me more moxie and determination in 22 March and April games than I remember seeing out of the 2010 version all year (save for that one series in Cincinnati). Start out 2-6 with an offensive lineup that was oft-questioned in the off-season failing to produce runs? The Cards are laughing in the dugout during those games. They’re loose. Even Pujols was grinning while he suffered through probably the worst season-opening slump he’s had in his career. Finally had enough at 2-6? Lance Berkman, the newcomer, steps up in the clubhouse and makes a speech. Not a win one for the Gipper, not a get-in-your-face tirade – just a calm, veteran, been-there-done-that “hey, we’re better than this.” The 2010 Cardinals didn’t have that guy. It’s not Pujols. It’s not Holliday. Berkman is exactly the person for that job, and he carries the necessary cachet to have folks listen – even, I’d bet, Pujols, Holliday, and Carpenter. Yes, this year’s version of the Cardinals trusts in their ability. They take a blow like losing Wainwright and look for the guy (or guys) who will step up to fill the void. They may not be the favorites in the division anymore, and they appear to be just fine with that, thank you. All the better to stay loose. To have fun playing ball. 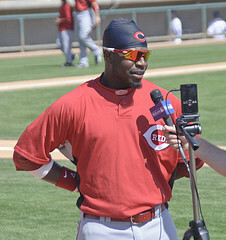 Hell, even to be able to joke around with Brandon Phillips during the weekend series. Sure, Molina wasn’t chatting up BP – but I saw at least Berkman and Theriot being cordial with Phillips at second base during the games. And why not? This is not the same team anymore. So was Brandon Phillips right about the 2010 Cardinals? Maybe. But the 2011 Cardinals couldn’t give a whit. Good points — I found myself nodding along as I was reading. One thing I desperately hope for, though: that Brandon Phillips can cease *being* a story when it comes to the Reds-Cards. I suppose he will have to be in a couple weeks when the Cards go to Cincy. But, after that, I hope it can all just stop. Thanks Chris, and I agree with your sentiments completely. This was meant to be a bit of my send-off to the whole Phillips “feud” with the Cardinals. It’s just not really much of a story to me anymore. I saw perhaps the most apt description of it today – seemed like last season he truly had a hatred for the Cards. This year he just seems like a “wrestling heel” – playing the bad guy because that’s how it’s “supposed to be”. I actually grew to like Phillips a bit over the course of the weekend series, truth be told.